At the May 26 Open House on the Palisades Elementary campus stood an 8-ft. red and white hat decorated with children’s drawings of colorful mushrooms, fish wearing glasses and blue-and-white striped Truffalo Trees with multicolor tops. Inspired by Dr. Seuss, the hat was constructed out of 13 boxes and was this year’s Art Cadre project at Pali Elementary. The program, for first, second and third graders, is led by educators Sal Kelly Siwulec and Debra Demontreux, who devise original ideas for the annual collaborative project. 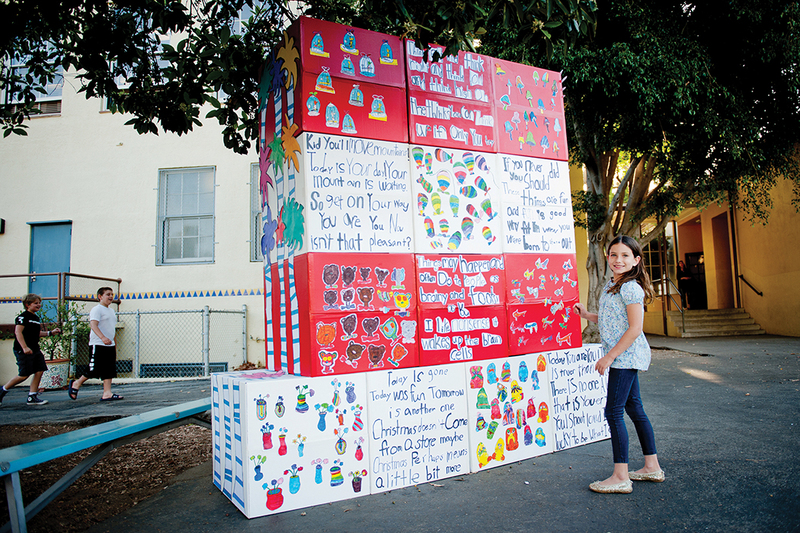 For the project, each of the 12 first-, second- and third-grade classes received a box, and painted it either white or red. “We talked about Dr. Seuss, how he loved children, how he was nonsensical and fanciful,” says Siwulec. Each child wrote a word that was later joined with other words to form some of Dr. Seuss’ sayings. In their next session, the students glued the words on and had a drawing lesson, where they each drew their own Dr. Seuss-inspired artwork, and glued those onto the box as well. Second grader Sage Denham participated in the Art Cadre project—a giant “Cat in the Hat” consisting of the children’s drawings, based on the art of Dr. Seuss and Dr. Seuss’ sayings. “As artists, a lot of art comes from your own creativity, but artists also learn how to draw by copying other work, with step-by-step lessons,” says Siwulec.Since a 13th box was needed to form the hat, the grade 1-3 teachers created a box as well. “It was nice to see the teachers do it too,” says Demontreux. Siwulec and Demontreux met with the classes two times in the Lori Petrick Garden to help the children create the individual parts of the project with the assistance of parent volunteers. Both educators also work for Art Trek, a nonprofit that brings art teachers into inner-city schools. Siwulec started the Art Cadre program with Nancy Fracchiolla, now the drama teacher at Palisades High, when their children were young. Siwulec’s daughter Claire, now a Pali senior, was in kindergarten at the time. After Fracchiola’s and Siwulec’s children graduated, other parents tried to keep the program going, but the school eventually contacted Siwulec to see if she would take a paying position. Demontreux, a former high school art teacher, and Siwulec’s friend since seventh grade in Michigan, had been volunteering and eventually came on board as a co- teacher. Demontreux lives in Topanga with husband Ernie and daughter Maya, a seventh grader at Paul Revere Middle School. Siwulec, husband Dan and daughter Claire have lived in the Palisades for 17 years.